Debra was everything we could have hoped for in a celebrant, charismatic, professional, beyond helpful and her attention to detail was outstanding. She met with us several times to discuss our ceremony, providing us with examples of readings and ceremony ideas. We were both nervous about doing our own vows but with Debra’s help she made it a stress free, enjoyable process. Debra ensured our ceremony was intimate and modern. She did a fantastic job writing and delivering a ceremony that was genuine and true to us. It felt very personal and we couldn’t of felt more comfortable. We still receive compliments, on how much our guests enjoyed our ceremony. We would highly recommend her services. Thank you Deb for being such a wonderful celebrant! We really appreciated the care and attention to detail shown in the recent Renewal of Vows for my Mum and Dad (even though they travelled from the UK). The fact that all the information was gleaned without my Mum's knowledge and that you were able to put all my little bits of info into such a meaningful ceremony is incredible. The time you spent preparing before and on the day whilst I was keeping my Mum away from the house was very much appreciated. 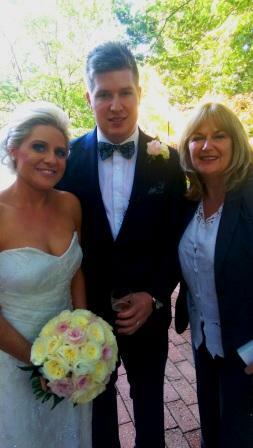 Mum and Dad wanted to thank you so very much for the “Best day of their lives”. We couldn’t have wished for a better day. From the very first contact we had with her she was just outstanding and exceeded my husband and my expectations. With Deb, we felt relaxed and were able to trust her with our most precious memories. Having moved the wedding forward by a year, I had begun to doubt my decision, but after this initial meeting, I was buoyed by her confidence and friendliness and became truly excited about becoming a bride. She wrote us a lovely ceremony, one that fitted our relaxed wedding day beautifully and had our guests laughing and relaxed with us. She was exceedingly patient with both of our stubborn families who don't listen to instruction. The finest details were thought of. The legalities and paperwork were handled efficiently. There were no surprises, she had pre-warned us of everything that was to occur. There was only the joy of marrying my husband with the help of a truly wonderful celebrant. Both myself and my husband can only sing Debra's praises, and urge you to meet with her for your big day. Our honeymoon was amazing, as was our wedding. We are getting a lot of comments about how heartfelt, relaxed and honest the ceremony was - a few people have even said it was the best wedding they had ever been to! Thanks so much for making it amazing and exactly what we wanted. I found Debra (Celebrant) when I Googled on the internet, I had no idea how to, or what I was looking for. But after reading all the great reviews, we were set. We then contacted her to organise a time for her to come around to our house to organise what we wanted. After meeting Debra, we were extremely pleased with the outcome, she's such a lovely lady, easy to get alone with, listened to what we wanted. Although we were only after something simple, she made it work :).... She was really friendly with our family/friends and easy going, made us feel really comfortable. We would definitely introduce her to others in future! Thanks Debra, once again, for your support in making it happen. Deb was amazing throughout our whole journey from start to finish. She put endless hours into getting our ceremony perfect. Throughout this entire time Deb modelled a high level of professionalism. Debra has a wonderful calming voice and during our ceremony spoke clearly to all of our guests.